Hunters Edge attends horse shows year-round both locally and out-of-state. We offer schooling, training rides, basic care and full-service grooming as well as hauling to and from horse shows. A & AA Shows are a fantastic opportunity to travel around the country and compete against the best competition. HES travels across the country attending these shows and sees them as a very valuable experience for serious riders. We tirelessly prepare our riders to compete to the best of their ability and the stage that A and AA Shows have to offer is an impressive one to say the least. We have had riders compete in countless shows including Devon Horse show , Washington International Horse show, Equitation Finals, Maclay Finals, to name a few. Hunters Edge is again pleased to be joining with MegFord Horse Shows to put on schooling show series for 2017. By working together, Hunters Edge and MegFord are able to offer hunter and jumper exhibitors and trainers excellent venues and multiple horse show opportunities throughout the year that will combine to one year end point total. 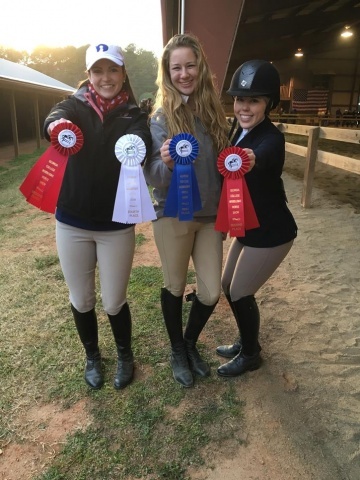 In 2015, the Ole Miss Equestrian Team partnered with Hunter’s Edge Stables as their premiere English-style Hunter Barn for their collegiate riding team. Ole Miss has riders of all skill levels, and the team comes for group lessons weekly. The team has continued to improve, and began competing in the Intercollegiate Horse Show Association (IHSA) events in the spring 2016. The IHSA competitions are quite different, as compared to the United States Equestrian Federation (USEF) events that we usually attend. It challenges the college-age riders because they are randomly assigned horses to take into the ring for judging at the event. It truly tests the rider’s abilities to quickly adapt to the horse in a stressful situation. At Hunter’s Edge, we encourage the Ole Miss girls to frequently ride different horses during their lessons to improve their skills and abilities to adapt to the nuances of other horses.